If you live in a region with hard-packed ground but want to garden or do landscaping, you need tools designed to penetrate the hard surfaces. A number of hand tools are made for this purpose. Many of these tools have edges that are designed to be used in multiple ways, depending on how they are held and driven into the ground. To start the ground-digging process, use adzes and specialized picks. Adzes are tools with long handles like brooms that have a sharp-edged blade on top, almost like and axe, but not as wide. Swing the adze up and then strike it into the hard ground to begin breaking up the hard soil, allowing the use of excavating tools once the hard ground is disturbed. Picks are another style of hand tool that are made to break apart hard ground. Most picks are dual sided and require a hard swing into the hard ground. Some picks have a small and pointed pick end on one side and a truncated adze on the other, allowing you to pick large areas of hard ground using both tools. After the initial ground breaking has been done with the picks and adzes, use hoes or hard rakes to remove the hard packed soil and sediment chunks. Hoes have a solid rake extending off a long handle. When the hoe rake is placed onto the hard ground and pulled back, the rake pulls a quantity of the hard soil away. Hard rakes are tined, or pronged. 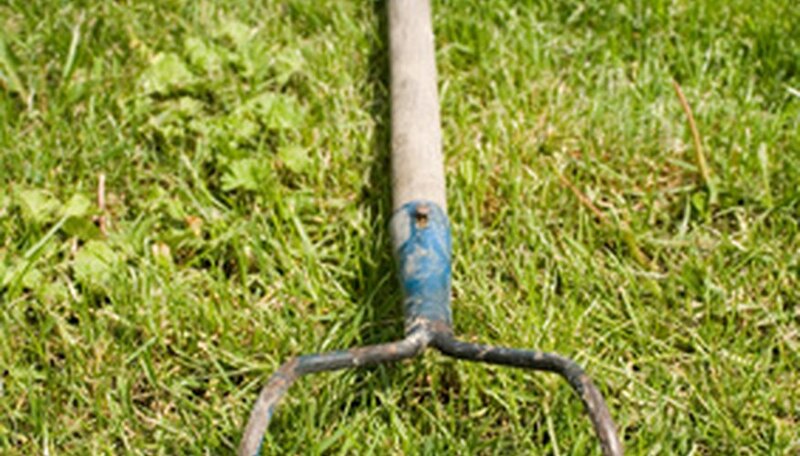 Use a hard rake when removing or disturbing hard ground that has mid-size rocks or chunky sediment. The tines scoop the rocks and chunks as you push or pull on the handle and scrape into the ground further, allowing more digging and disruption to the hard packed earth. After the major ground breaking is done, use hand trowels to do the finesse work. Hand trowels are small spades and shovels that dig into hard ground in small quantities--a good option after the major work is over. Hand trowels dig into small areas, allowing you to plant saplings or seeds throughout the broken hard ground. Specially designed ground saws are also used when the big work is done. Grip the ground saw and saw away at the disturbed ground edges at an angle to remove large sections in flakes. Ground saws are narrow and have very jagged teeth. Why Do You Plow the Soil Before Planting Seeds?